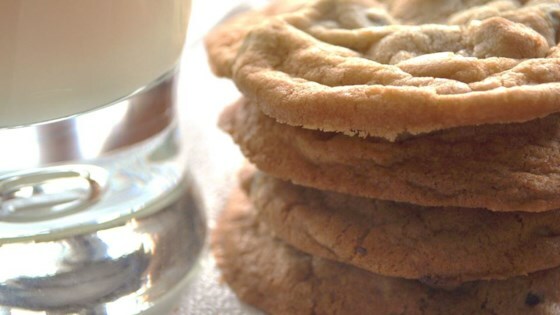 "Bake these for 8-10 minutes for chewy cookies or 10-13 minutes for crispy cookies. ENJOY!!!" Cream sugar into shortening. Add milk and vanilla beat until fluffy. Blend in egg. Then add dry ingredients and mix well. Stir in chips and nuts. Drop by teaspoon onto greased baking sheets and bake at 350 degrees F (175 degrees C) for 8-10 minutes for chewy cookies or 10-13 minutes for crispy cookies. ENJOY!!! See how to make chewy, bakery-style cookies. I just got them out of the over and they are the BEST!!! They made exactly 4 doz. Note that I used 1 tsp powder and 1/2 tsp soda. Thanks so much for this awesome recipe. Yum....I just wanted one so I baked one BIG cookie! Excellent flavor, kinda flat, but very good.